Your baby's skin needs extra gentleness to preserve its innocence. 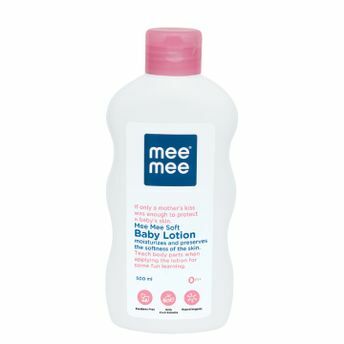 Mee Mee Chamomile Baby Lotion with it's non-greasy formula restores the delicate balance of baby's skin with its antioxidant properties. The natural moisturizer gets absorbed easily, gently protecting the soft skin of your baby. It is infused with the goodness of chamomile, rich in antioxidants, which moisturizes and effectively protects the delicate skin. The lotion has been dermatologically tested to make sure that your baby gets only the good stuff, along with your loving touch!